Magnetic Screwdriver Set w/ 15 bits Great for Cellphones, Computers, Gaming Devices Includes: T6, TORX, PHILIPS, SLOTTED, SPANNER, TRI-WING, BENT PRY TOOL, ROUND AWL, RESET PIN for Game Boy Advance, Nintendo Wii, DS Lite, NDSIdeal for accessing fasteners in tight areas. * Screwdriver in set features 1/4" hex bits. * Exact Fit Precision Machined Tips. 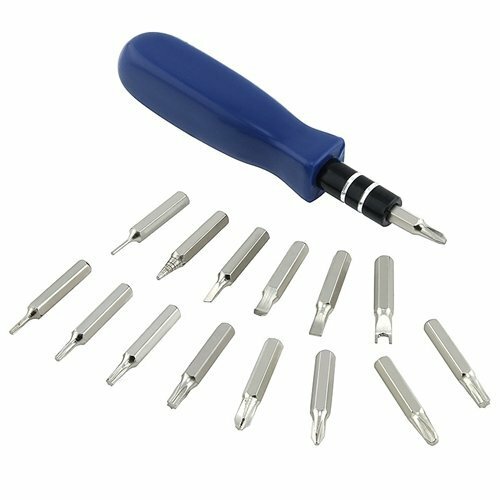 * Good for cellular phones, laptops and gaming devicesKit includes: Screwdriver head,T5, T6, T8, T10, T15, PHILIPS: #0, #1, #2,SLOTTED: #2 , #3 , SPANNER #4, TRI-WING #0, BENT PRY TOOL, ROUND AWL, RESET PIN.